Note: If you were a regular WP Follower or Email Follower of this site (50+ of you good folk were), then you will have to ‘Re-Follow’. Sorry for the hassle. Found these nice pics recently of some fall fatbiking on the Oak Ridge MTB Trail (Winter Fatbike & Snowshoe only) at Birds Hill Prov Park. Oak Ridge is a terrific MTB singletrack trail developed by the local MTB cycling community and maintained by local volunteers in cooperation with MB Parks. Oak Ridge Trail has it’s trail head at the Parking Lot shared with the Bur Oak Self-guiding Interpretive Paved Path. 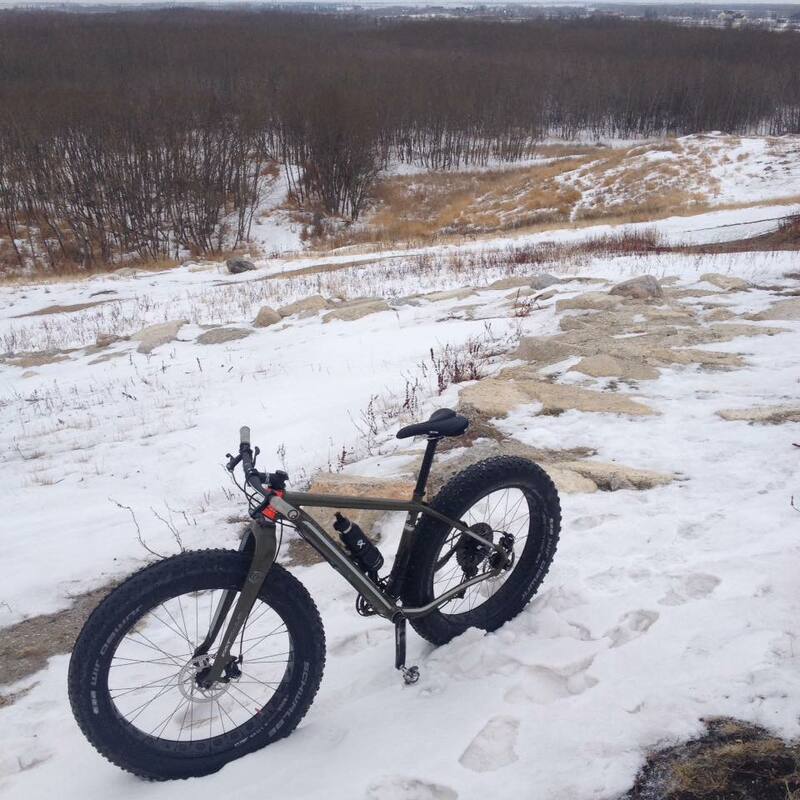 In the past, we used to refer to Oak Ridge as Bur Oak; that is until it was recently named officially by MB Parks as Oak Ridge MTB Trail for use in the summer and in the winter for fatbikes. For winter fatbiking the “Minimum Tire Width 3.8 inches” and a recommended tire pressure of 8 PSI or lower to prevent rutting when the trail had been groomed by volunteers and Park staff. Have fun out there on the Oak Ridge Trail whether you are on a MTB, Plus Bike or a Fatbike. *** BUT once the snow arrives and the trail is packed and groomed (by volunteers and park staff) … it’s time for Fatbikes Only. Here a few drone view pictures shared by Wayne Bishop of 2 Wheel Revolution showing some of the recent development at Bison Butte (located at Fort Whyte Alive in Winnipeg) that he has been helping Alex Man and others accomplish recently. If you see Wayne, Alex or any of the volunteers; make sure you say a huge thanks! Check out Fat-Bike.com’s recent review of Apidura’s Bikepacking Backcountry Bags that work great on fatbikes. Eric was in town to pick up some gear and then head out onto Lake Winnipeg to be Lead Instructor on his 2018 “Polar Travel Training Course” (which included our American fatbiking friend Bradley D. Paul, who took part in our “2017 Lake Winnipeg Fatbike Crossing & Campover” adventure). Today is a tough day for many of us! One year ago we lost a friend and fellow fatbiker adventurer, who died training as an RCAF SAR Technician, so that he could be ready to answer the call to respond to any dangerous mission to rescue his fellow Canadians in distress! For many, losing Alfred was the loss of a loved one, family member and a person they respected and looked up to! Today we remember with sadness, but also with thanks for having known such a kind, compassionate, brave man who shared his strong ethical character ‘on his sleeves’! WOW! Super congratulations to both Nina Gassler (Honourary Manitoba Fatbiker) and our very own Dan Lockery for finishing the Alaskan Iditarod Trails Invitational (ITI) 350 mile race on their fatbikes! The conditions were tough and they rose to the challenge! Super congrats to Nina, who was the Women’s 350 Champion! Very interesting and successful Lake Winnipeg Recce! Huge thanks to Kevin Champagne and his wife Louise, who arranged for a third snowmobile for me to ride as we rode out from Grand Marais toward Gimli. We had to find an initial crossing point just west of Grand Marais through a field of ice chunk pop ups and minor pressure ridge – no problem. Pretty good conditions on the lake with plenty of snow on otherwise clear ice and sections of snow drift but not too deep. Found a nice campsite with a bowl of snow surrounded by big and small ice chunks sticking up and one large one at the ‘entry’! Good track made all the way about 85% across and then we came to a large and long (NE-SW) pressure ridge that was dicey to cross without a ‘ramp-plank’ (we can arrange that for Saturday). You could see the harbour area in general but it’s still about 4 Kms. Anyways we cruised back over our same tracks and hopefully the mild conditions this week with overnight -10C ish temps will bond the snow to the ice and firm up the track we made. Big Picture – looking good! We will need to monitor the weather and make a few provisions, but the basic plan still looks fine! Try winter cycling in RMNP! Join cycling enthusiast and former area resident Adrian Alphonso at a free outdoor workshop as he explains some of the finer points of winter cycling, the morning of February 10, 2018. In the afternoon, Adrian will lead guided rides for visitors on two hour-long outings. Bring your own bike, or register in advance with Friends of RMNP at 204-848-4037 to rent your bike. Events take place at the RMNP Learning Centre, 154 Columbine Drive in Wasagaming. Number of places limited for outings. Winter Bike To Work Day: Friday 9 Feb 2018 … let’s roll fatties! I was able to clean Stairway To Heaven (the rocky switchback ascent out of the treeline) today. Bison Butte is in amazing shape today. Get out and enjoy it. “Out of my mind…. so happy and humbled by the support of my family, old friends, new friends and newly aquatinted riding mates. It takes so many people to make a success of these races. So many talented people that make 2WR what it is! We figure the best way to welcome the New Year is to get out and scout the trail. Come join us! Location: Meet at the South side of Senkiw Suspension Bridge (https://www.google.ca/…/data=!3m1!1e3!4m8!4m7!1m5!1m1!1s0x5…). Purpose: To scout the Actif Epica course South of the Senkiw bridge heading toward Ridgeville and going as far as we can South toward the border along the Crow Wing Trail. 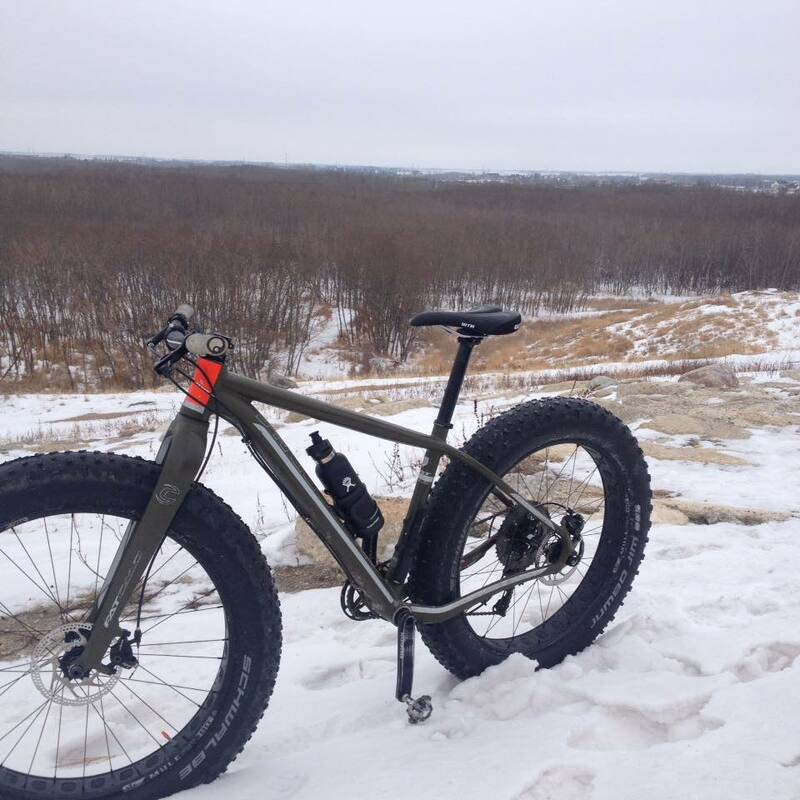 Who: The Trail Crew (Dallas, Pete and Dan) will be riding at a slow rolling pace (on fat bikes) and would love it if you brought ANY type of bike and joined them (bring friends on bikes too!). The Plan: To go have a look at this section of the route, take a few pictures and enjoy a fun, sociable ride-out from South of the suspension bridge toward the CAN/US border and then return, following the Crow Wing Trail. The total distance will be approximately 40km. We will roll out at 9am and estimate the total ride time to be somewhere between 3-4 hours. In case you are late setting off, you can follow along with the blue-and-white-arrow Crow Wing Trail markers and catch up with us along the route as we will be moving at a comfortable pace and stopping to take pictures now and then. Also, there will likely be a post ride discussion over coffee/food at a local establishment should you feel so inclined. Important Note: All participants join us at their own risk (e.g. please be safe, wear appropriate winter riding clothing, a helmet, bring blinky lights for improved visibility, enough food and water for the ride and a basic repair kit). Citing a famous quote, “YOU ARE RESPONSIBLE FOR YOU”, so please respect the nature of a winter riding adventure, it can be unforgiving.